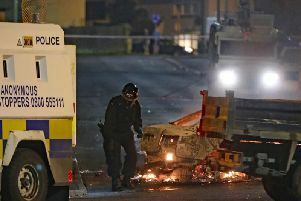 SNP MPs have accused the UK Government of "buying DUP votes" by allocating cash to help Belfast following a major city blaze while failing to provide funding for Glasgow, also hit by fires this year. The Chancellor announced £2 million to help the Northern Irish city recover after the historic Banks Building was gutted in August, leaving several businesses unable to trade. However his Budget contained no similar funding for Glasgow following a second disastrous blaze at the city's art school in June, and the Victoria's Nightclub fire in the same area in March. The Conservatives depend on the DUP's 10 MPs to give it a majority in the House of Commons. Glasgow Central MP Alison Thewliss said: "I wrote to the Chancellor last month to plead for a VAT exemption for businesses affected and for buildings in need of repair, as well as investment to regenerate the area, in the wake of the dreadful fire - it's clear from the UK Government Budget that those pleas fell on deaf ears. "It's hardly surprising that Belfast will benefit from regeneration funding in the wake of the Bank Buildings fire - the the Tories are too busy buying DUP votes by investing in Belfast, whilst completely ignoring those in similar circumstances in Glasgow. "When cash can be found to help regenerate Belfast but not Glasgow, it proves that the UK Government hold my constituents in contempt in its use of brazen political back-handers." The Treasury highlighted the £10 million announced for the Glasgow School of Art following the 2014 fire, and said the government continued to invest "heavily" in Glasgow, with the Glasgow City Deal providing £500 million of UK Government investment over a 20-year period.